My mouth waters just at the thought of Lamb Barbacoa. It’s a simple stew that you can enjoy on a Sunday morning when everyone’s at home and has time to enjoy a relaxing brunch. I always prepare this meal overnight, I just add everything to the slow cooker and forget about it until the next morning. The garnishes are also prepared ahead of time. That way the only thing I have to do in the morning is warm the tortillas up and serve the soup. 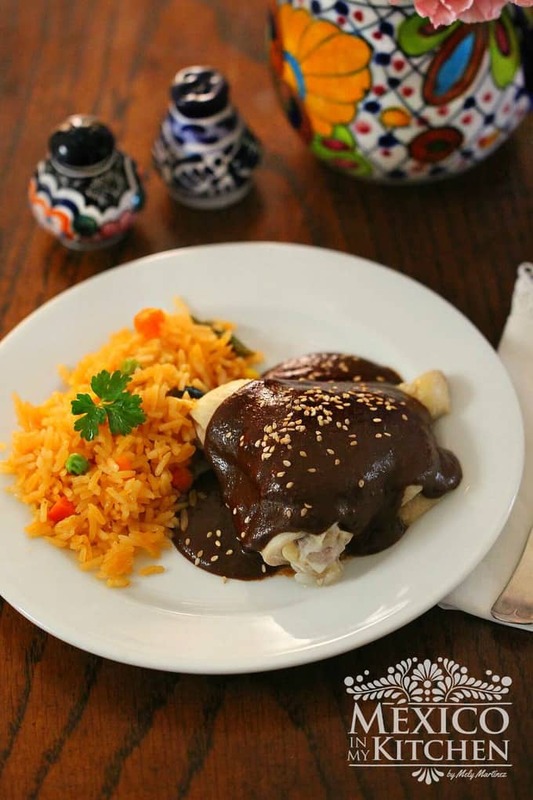 Traditionally, this dish is cooked in a pit, in places like the states of Hidalgo, Tlaxcala, and Edo. de Mexico. It’s wrapped in Agave leaves and cooked all night in the ground in a hole that’s about 5 feet in diameter and 3.5 feet deep. The bottom of the hole is lined with medium sized stones, then logs are placed over the stones in a pyramid shape, like a fire pit. The fire is then lit for about 3 hours until you have abundant coals. The stones are removed from the hole with a shovel and rearranged at the bottom of the pit, with some coal removed to be used later. Agave leaves (previously roasted) are placed in the hole to cover all the coals. A large pot of the broth’s ingredients is set on top of the maguey (agave) leaves and a wireframe is placed over the pot. The Lamb is wrapped in roasted agave leaves and placed over the wireframe/grill. A large, wet heavy cloth is placed on top and them; this is then covered with a thick layer of soil, the hot stones, and the coals that were previously removed. The cooking time will take approximately 7- 8 hours. Yes, making this the traditional way will be kind of difficult for must of us, but it’s really easy to make on the slow cooker or in a Dutch oven. Place the potato, carrots, onion, garlic, serrano pepper, rice, and chickpeas in the cooking pot. Cover with 6 cups of water. Place a steamer or metal cooking rack (I use the metal steamer from my pressure cooker) over the vegetables, this will support the meat. Season the lamb rack with the coarse sea salt on both sides. Place on the steamer. The meat usually doesn’t touch the water, it is cooked merely from the vapor/steam. Place the avocado leaves on the lamb. Cover the pot with aluminum foil and then place the lid on tightly. Cook for 4 1/2 hours on high in your slow cooker or for about 1 hour in a large pot/Dutch oven on your stove top over medium heat. To serve, skim off the fat floating on the surface of the broth, remove garlic and onion pieces, and divide the consommé and vegetables into 4 bowls. Place the meat on a serving plate to allow everyone to make tacos with the warm tortillas. Garnish with cilantro, onion and lime juice. Don’t forget the hot salsa! Slightly toast the avocado leaves over medium-high heat on a griddle. • *You can substitute the uncooked chickpeas for canned chickpeas. If using the canned version, add it to the stew a half hour before finish cooking. • You can also use a Leg of Lamb, or a combination of both leg and rack, for more servings. • This recipe will render 4 large bowls of consommé and about 2 -3 tacos per person. • This is the slow cooker version, if cooking in a Dutch oven over the stove top, it will take about 1 hour, or until meat is tender. Mely, me quedé con la boca abierta! Literal. Qué gran receta y las fotos! Te felicito! Me encanta la barbacoa de borrego! What a meal! I usually don't like lamb but I think I'd devour yours. Great job. Do you have to use lamb? Can you use beef or pork? I love barbacoa but i don't think the kind I've eaten is lamb. I could be wrong but i always thought it was some type of beef. As I mentioned above, this is a popular way to make barbacoa in the Central States of Mexico, like Hidalgo, Tlaxcala, Edo. de Mexico, Puebla and others close by. But all over Mexico, there is the beef barbacoa made using the beef head and neck. There is also chicken barbacoa and fish barbacoa. You can absolutely use beef or pork is you like using this recipe as a base. Is rack of lamb inexpensive where you live? I am curious as to why you use the rack rather than a shoulder or even a leg or belly? I wouldnt dream of cooking a lamb loin or rack past medium. I live in Dallas, TX, and the leg is more expensive than the rack. You can use other cuts of the lamb to make this dish.